Аll-Russia Institute of Aviation Materials (abbreviated to VIAM in Russian) is presenting at MAKS 2017 a prototype small-sized gas-turbine engine for unmanned aerial vehicles (UAV). What makes the prototype special is that, for the first time in Russia, it was manufactured with the use of a 3D printer. 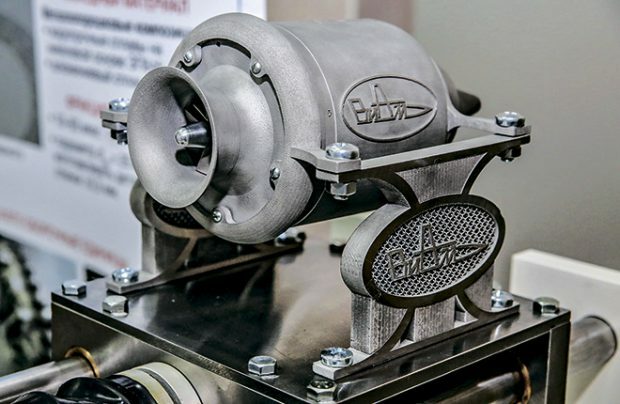 VIAM used its in-house additive manufacturing technology, which involves laser-assisted fusing of layer upon layer of powdered nickel and aluminum alloys, the materials which were also created by VIAM specialists. This breakthrough technology allows for 3D-pringing of parts at 30 times the speed of traditional production methods. The prototype weighs 900 grams and produces 10 kg of thrust. Bench tests have already been carried out. A VIAM spokesperson told Russian Aviation Insider that three more prototypes, producing 20, 125, and 150 kg of thrust, are planned to have been printed and tested by the end of 2018. Also participating in the project is Simonov Experimental Design Bureau.